San Francisco Tours of the Entire Bay Area. Private Luxury Tours by San Francisco Limo. If you're short on time but looking for a great tour to discover the San Francisco Bay Area, we have the perfect trip for you! Hire a private limousine from San Francisco Limo to experience the drama of the Bay Area's world-famous bridges and views. Our unique 3-Bridge San Francisco tour takes you over the Golden Gate Bridge, Bay Bridge, and the San Rafael Bridge in a private limo, giving you a firsthand look at the breathtaking setting of San Francisco, the famous "City by the Bay." Not only do you benefit from limousine luxury, but you also have the flexibility to plan your own tour if you wish! We also offer a standard planned your, described below. Our Three-Bridge San Francisco Tour begins at Telegraph Hill and Coit Tower, with scenic views of both the Golden Gate and Bay Bridges, as well as much of downtown San Francisco and the wider Bay Area. From here you can see the path of your entire San Francisco Bay Area tour! Next your limo crosses the Bay Bridge to Oakland, where you can visit historic Jack London Square and Oakland's Chinatown. 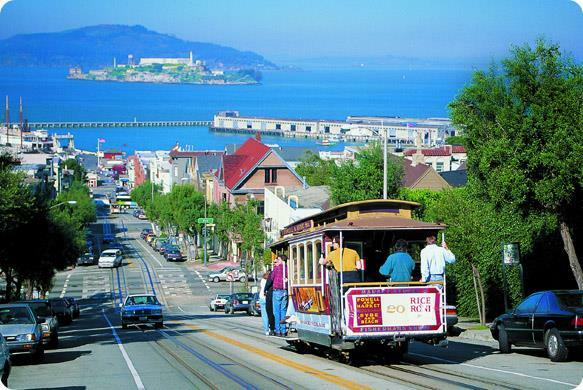 Or your Bay Area and San Francisco tour can stop for a shopping trip in West Berkeley's exclusive shopping district. When you're done in the East Bay, sit back as your limousine crosses the San Rafael Bridge into Marin County and the North Bay Peninsula, featuring cozy towns like Sausalito and impressive San Francisco vistas. Take a break in Marin county for more shopping or a bite to eat, then stop at the famous Golden Gate Bridge overlook, a great picture spot for anyone looking for a classic San Francisco picture opportunity. Now it's time for your San Francisco tour to cross the incomparable Golden Gate Bridge, returning you to San Francisco proper. If there's time, visit Fisherman's Wharf, the Marina or Chinatown, before your limousine returns you to your hotel or address at the end of your 3-Bridge San Francisco Tour. Join us in exploring the gorgeous San Francisco Bay Area!